Every startup has high hopes, and Carbon Age Systems & Manufacturing is no different. The fledgling company, established in January of this year in Marietta, Ga., by president and chief engineer Albert Cousins, is a custom manufacturing and mechanical engineering services firm that offers mechanical design assistance, CNC milling and turning, welding, and full parts inspection. The company also designs and produces automated and robotic systems to improve client production and efficiency in their own operations. The company's goals include providing high quality parts and systems for clients in the medical and aerospace industries, as well as developing robotic assistance devices to help the elderly, wheelchair bound, and autistics. "One of our goals is to try and develop systems to help people that are injured or infirm, and we have a special focus and interest in developing systems to use technology to help autistics," Cousins told D2P in a recent interview. "One of the interesting things is that my design guy and myself are both people with Asperger's Syndrome. Taking that and combining it with the fact that we're mechanical, it works out to give us a unique perspective on looking at the design and building up of systems. I've been working on developing connections with one of the county services groups that helps people that need a lot more of that type of assistance." Cousins, a 20-something graduate of Southern Polytechnic State University with a degree in mechanical engineering technology, is a certified manufacturing technologist. 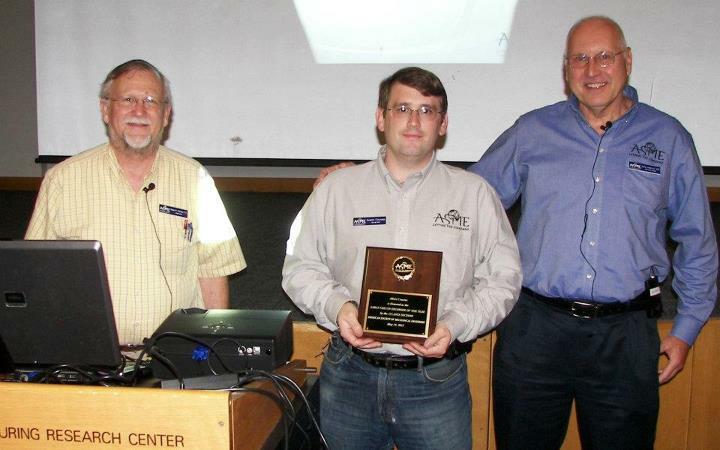 Last May, he was named Early Career Engineer of the Year by the Atlanta chapter of the American Society of Mechanical Engineers (ASME). A classmate of Cousins at Southern Polytech, Jonathan Parriott, works side by side with him as the company's mechanical design technician. They've already teamed up on projects that include a personal cooling system that can be used by welders and boiler room personnel working in hot environments. "We're calling Jonathan a technician only because while we're in the middle of ramping everything up, I can't pay him as an engineer until we have more things going," said Cousins. "And when I can pay him as an engineer, his title will change back to engineer." The company (www.carbonagesys.com) is currently seeking to raise capital to secure the 20 percent needed for collateral on a larger loan, which will enable it to move into a building of its own and use its own equipment. Currently, Carbon Age Systems & Manufacturing is renting machine time at a business development group. In a post on GoFundMe.com, Cousins writes "What makes this project different from others is that it is my pursuit of my life goal to improve the world with robotic/automated systems and to make use of my unique world view as a mechanical engineer with Asperger's syndrome. My work in engineering, as well as my lifelong interest in robotics, has led me to the creation of this company." Cousins says that the company's biggest strength derives from its lean mentality and quality system. "This combination comes from our small team and allows greater flexibility for fulfilling our orders while focusing on the quality of all parts and systems built. Our customers choose us for this and our friendly customer service with quick response to questions and requests." "Sometimes people assume that individuals with Asperger's may not be as successful in the workplace as their peers," said Jennifer Repella, vice president of programs at the Autism Society (www.autism-society.org). "In fact, people with Asperger's are often star employees with the right support and in a job appropriate to their unique skills and strengths. They may be proficient in knowing categories of information and may be skilled at memorization. A strength of some individuals with Asperger's Syndrome is they often intensely focus on tasks of interest to them." Design-2-Part Magazine spoke with Albert recently about the company's engineering and manufacturing capabilities, his unique world view as a mechanical engineer with Asperger's, and how it can actually be an advantage in some ways in his work. Following is an edited transcript of our conversation with Albert Cousins. D2P: Why did you select Carbon Age Systems & Manufacturing for the name of your company? Albert Cousins (AC): My design guy and I were debating for a while over trying to figure out what would be the best kind of a name for it, and we decided upon Carbon Age because it just seems to fit with the current period of time. We've had the Stone Age, then the Copper, then the Bronze Age, then the Industrial Age, which is, essentially, the Steel Age, and so many materials now are involving the use of polymers and other things that are carbon based. We thought that it would be more accurate for us to say, 'It's the Carbon Age' now, and 'Systems' and 'Manufacturing' are chosen because that's the primary stuff we focus on in providing the design, development, to produce someone's design concept, whether it be a system or just a few parts. We also have the ability to manufacture that for them as well, to help them try to bring it to market or bring it--at least the concepts--to a physical model so they can decide what to do with it from there. D2P: Can you talk a little bit about your company's capabilities in CNC machining and welding? AC: In our CNC machining capacity, currently, we are just doing 3-axis milling. We are in the process of currently moving, and are going to be upgrading to have 4-axis and the CNC turning. Right now, our office is set in one location, and the shop is in another, and within the next couple of months, we're going to be joining the two together. D2P: Can you talk about your mechanical design assistance and how that's helpful to clients? AC: One of the projects we're working on right now is an off-road wheelchair for assisting people who want to go to art shows, and we're trying to also connect up with the Wounded Warrior project to try to provide an option of a product for injured veterans. We've been involved in designing the roll cage, creating a bumper system with powered lights, so that people can see where the rear of it is. Because we came into the project late, the current model is being built on top of a zero-turn lawn mower's body as the base to save us design and build time. We're widening the rear wheels base by changing from a single wheel to a dual wheel. On the ground, the roll cage is just going to be a light one to just give you general protection in case the thing does flip over one way. It's not going to be like a crashworthy one, but it's just [meant] to prevent the machine from turning over and hurting our rider, who's going to be in a five-point harness on it. D2P: It sounds as though you have ambitions to design and build your own products. AC: Yes, as well as helping anyone that would ask us to help them develop theirs. If a client wishes for us to just be focused on one area of it, we'll gladly stick within that. We would like to take on more if they have the need for it or request it. But we'll stay focused on exactly what the customer has asked. D2P: What got you interested in the first place in mechanical engineering and manufacturing, way back when? AC: I've always liked designing and inventing things as solutions. And my family had a farm, so as I was growing up, I got the chance to have more and more experience around mechanical and hydraulic systems. A veterinarian I knew got me into welding courses at West Georgia Technical College in LaGrange, Georgia, and then I found out about the mechanical engineering technology program at Southern Polytechnic State University in Marietta. And it allowed me the chance to have the hands-on teaching by the professors that I wouldn't be able to get at Georgia Tech, and it was a lot more project-driven, so it just fit in more naturally with the way I look at everything. D2P: You've said that your goal in life is "to improve the world with robotic or automated systems and to make use of my unique world view as a mechanical engineer with Asperger's syndrome." What motivates you to want to improve the world with robotic systems or automated systems? AC: There are a lot of things in this world that need to be done consistently, or just could be simplified a little bit for the people using it by introducing either a control, or at least a monitoring function--like adding a digital readout or an NC controller to a mill. You can still achieve all of these great and wonderful things with a manual capability, but with the precision and tracking that you can get with an electronic or mechanical system to help track it, that gives you the capability to see and observe how it's functioning. And, applying that to helping people, I've just seen that there are so many things that could be simplified. And it could also help keep people safer. One of those systems that I'm trying to get to develop is a personal assistant robot. D2P: What other types of robotic assistance devices are you interested in developing to help the groups of people that you mentioned--the elderly or wheelchair bound, or people with autism? AC: I also have a number of friends that have been injured in war time, and I'm trying to see what their needs are with prosthetics. Basically, I have a few friends that literally have trouble communicating and moving, and are wheelchair bound. I'm trying to work on making a connection with the project by Autism Speaks. It's the 'Hacking Autism,' where it's touchscreen systems. If I can get a proper connection with them, I would be helping to develop quick mounts to help people carry around those systems with them and to help them be able to use them. I build all kinds of systems. I like taking other people's problems or situations and breaking them down. With the wheel chair project, as soon as they started mentioning details about it, I ended up picturing the exact model of the sort of lawnmower we'd be using as the best option base, and that's what we ended up getting a chance to get. I love problem solving, and for me, this is fun work that allows me a chance to try and make a dollar while I get to do what I consider fun. D2P: As a mechanical engineer with Asperger's Syndrome, would you say that Asperger's helps you solve problems in ways that others might not be able to? AC: I'd say it does because it allows me to lock on a lot better to numbers and data. When I run concepts for a project, I literally picture charts and such, down to a [level of] detail where, when I was finishing college, doing my thermodynamics courses, we could use the book to flip through, but I could just picture the chart and be able to read the chart from the image in my brain. People with Asperger's typically have trouble interacting with others because of the communication issues, but with the mechanical engineering, people usually have less of a 'communications expectation' of mechanical engineers and engineers in general. So that helps to give me the little bit of the extra tolerance in expectations from others, for them to then start listening to me and see how I'm starting to break things down. And in some ways, it gives me an accelerated capability of processing things that I'm seeing in front of me. D2P: I understand that you have experience in manufacturing satellite uplink trailers and related mounts, and that gives you an understanding of how materials like aluminum and Delrin perform under stress. How does your experience allow you to suggest and make redesigns to parts made from materials like aluminum and Delrin? AC: I have a good familiarity with Delrin because we were making a lot of products from it when I was working for Finite Precision, which is where I earned my experience. They were a subcontractor for both Miller and DataPath. I was both the production saw operator and also had been offered the position to be the quality engineer after I got my degree, but the company closed completely before I had a chance for that. But because I did all the deburring, I found out how each thing would wear, or where you would make a certain sort of cut. A lot of it really came down to feel because I was working with them every day. It's a little hard to put it into words, but the experience around it allows me to just think about the application, the stresses, and the usual wear. I also have experience with firearms, where 70 75 P6 Aluminum is regularly used in the field, and know how that is treated for being able to survive those sorts of environments. Getting to be a part of the manufacturing process gave me the experience to develop an intuition regarding those. It's hard to put into words, but it's just one of those things where once you have the experience with it, it's something that comes more naturally. And it relates back also to the Asperger's nature because once you get more familiar with the machines--and you're naturally going to be more familiar and able to interact with machines and mechanical systems, because you really think and react very mechanically to things. So that is where that comes back in for me to just know and feel for those materials being put into use. D2P: Why is Carbon Age Systems and Manufacturing a good source for medical parts manufacturing? AC: Part of why we're a good option actually comes down to some of my personal life experience and the environment I grew up around. My Mom was a head ER nurse; my Dad was a cardiologist. My older sister is an ER doctor in the D.C. area, and my older brother is a pacemaker sales representative. I've just grown up around that environment and I have an understanding of how things go in that industry. I've worked as a medical validation engineer on a dry heat oven project, as well as helping build the sensing arrays that were in use for maintaining autoclaves at a client with a company that we're partnered with for doing their manufacturing. We're also a good resource because our design guy has worked in design and build of irradiators and calibration equipment for radiation sources. So he's familiar with the types of tolerances that are required for that, as well as with the materials. Between the two of us, we have the knowledge and the experience around these systems. I've always wanted to build things that are for medical [purposes]. Any time I have the interest in something, I study, I research, I follow the trends, I read all of the magazines, I research every single sort of material property. I dedicate myself wholly to my projects that I bring in for the company, but if it's something medical, I'll throw myself even more so into it to make sure that it does the best to help others. I want to do everything I can to improve life. It fits in with our ideology and the amount of focus we will put in to help develop and build the systems. D2P: It also sounds like the quality of your company is key as well. Are you currently certified to ISO 9001:2008? AC: We are not currently certified, but we try to do everything to follow to the standards. We're working on rewriting all of our policies to be ISO compliant. I've worked for an ISO 9001:2000 company that did injection molding, and they were also 14001 certified and a Lean Six Sigma company. I worked there on the production end, being a machine operator for two years, so I know how the processes and the documentation goes from that end. With the medical validation work, I've worked with it from the engineering end of it to make sure everything is properly documented, and it's just more natural for me to be able to do it that way. We are working on getting our certification as soon as we have our funds straight. And as soon as we have that straight, it would be 3-to 6 months after we initiate it to be certified. D2P: You mentioned earlier that you're in the process of--or you will be soon--of merging the office with the shop. When do you expect that to occur? AC: I expect that within about three months. It all depends on how it's going with negotiating with the City of Atlanta for the place where we have the shop, where it's going to move and set up. As soon as the shop is stabilized, we'll move our office operations into the office side there, and we'll have a better place for meeting people. Because currently, we go to their locations to meet with them, and just post as many pictures as we can of our projects and such, currently through our Facebook page for the company, while we're in the middle of fixing our actual website. D2P: So it sounds like you have a site selected already? AC: We do, and since we're still a fairly young company, we're working through another group to help support us. And the person who owns that company and site--it would be a company set up within his company's facilities where we'd be getting all the machining space that we need to move our equipment to. He has the experience working in the industry, too, and he's been advising us to help us develop our company. His business is incubating other businesses. That way, we're not completely wandering out into the wilderness alone. The main thing that we've been doing while we're still a young company is build up and make use of every single advisor that we can, as well as recommending them to others as well that have been expressing similar interests. D2P: You've mentioned several products that would fall under the medical category. Could you give some examples of the types of parts that you're capable of producing for medical equipment? Making any sort of an end effector, because of our knowledge and experience with robotics, and working with some of the larger robots. They may have been more for industrial use, but the end effectors and controls within them work exactly the same as the end effectors and controls that are for, like, the Da Vinci system, robotic medical system. It's just a matter of how those individual pieces have to be sealed; the tolerance differences are about a factor of 10 to a hundred in that much tighter. It has to be for preventing microbes and having more resistance to things. But the technology behind it is exactly the same; it's just more precise control and more precise tolerances to it. D2P: Are you aware of any trends that are influencing what medical equipment manufacturers are requiring from their suppliers? AC: I've noticed a lot of the moves have been toward the 3D scanning of patients crossed with the 3D printing. Like, for example, a woman who recently had a head plate put in to match the profile of her head. To make implants fit to the person, some of them are laser sintered to allow it to have more of a custom fit. A lot of what I've been seeing is not so much focusing on 'just produce a product;' it's each product is custom. It's a matter of making it so that it fits the user, and thus producing something that's going to work better, with lower chances of rejection and lower chances of there being a problem. If you just needed to have a handle that could be used by a particular doctor in a hospital, and it gets damaged, you don't have to worry about it because you can just toss that, hit print, and it'll do the profile of the person's hand again for the grip. Now they've got a new grip for them to work with, and it allows for you to quickly swap out. The main trend I've been seeing is the sheer level of the customization and fitting to individual patients and individual service providers. As I walked through the SME Rapid Manufacturing Show, I saw that medical had the strongest representation there for the different 3D printing systems. That's part of why we are looking into going into that direction. The older way is Lean and Six Sigma, and it's now working toward digital as a way of describing the organization. It's the precise fit for the situation, and just change out a few elements to better fit both the client and the industry that you'd be serving. That's what I've been noticing as the trend. It's essentially digital/the app model for service providing, and that's what I'm seeing as the cutting edge of everything right now. D2P: Some of those applications are pretty amazing. Do you have a 3D printer? AC: We've not acquired one, but we have access through one of the suppliers for them. We can get a few one-shots to help our client get a feel for their concept. We have a long term plan of adding that. And, in order to help us 'back work' a product and also to work with the in-process checks, we have plans to be adding a Faro arm so we can have the CMM capability, but not the confined parameters that traditional CMMs have. D2P: Is there anything that I didn't ask that I should have asked about your company's capabilities? AC: Not that I'm thinking of at the moment. But as just sort of a comment to go with it: It's important to get people interested in the STEM (Science, Technology, Engineering, and Math) field. That's why, while I'm in the executive committee of the Society of Mechanical Engineers, we are helping to sponsor one of the high schools around here--Pell High School--in their first robotics effort. Because if we don't have engineers or people who can understand the technical, as everything is increasing in technical density, the country and the companies, as a result, don't have a chance. It's a matter of just always looking to try and inspire creativity and capability, which is another principle of the shop that's helping us while we're in the middle of trying to ramp up and set up.